Combine the flour, yeast, sugar and salt in a large bowl. Add warmed milk, oil, and egg + yolk to the flour mixture. Beat on high speed for two minutes. On low speed, stir in about 1/2 cup more flour until dough holds together. Knead the dough on a floured surface about 100 turns. Cover with plastic and let rest 10 minutes. Cut the dough into three and roll each piece into a 16-inch long strip. Braid as you would hair, tucking ends under and place on baking sheet. Cover with a towel and rise in a warm spot until double in size – 40 minutes to an hour. Meantime, prepare egg wash by combining 1 egg yolk with 1 teaspoon water. 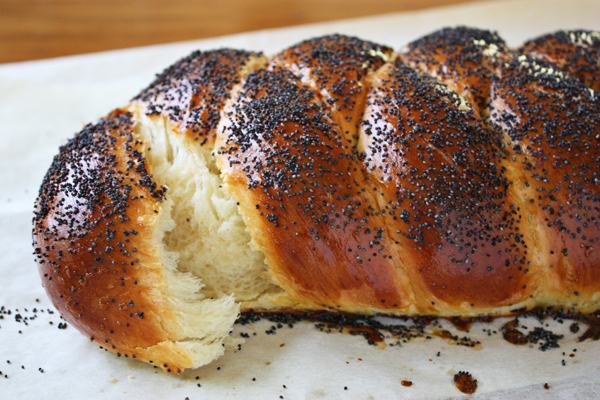 Preheat oven to 375° F.
Brush loaf gently with egg wash and sprinkle with poppy seeds. Bake for 25-30 minutes. If top starts to brown too much, cover with a foil tent. 35 Comments on "Egg Bread"
This recipe made the childhood deli challah of my dreams. I’ve tried a number of other, much more complicated recipes that weren’t nearly as good. Thank you! Jenny you are the BEST. Just found your website and I praise the day! Your videos and personality are just great. Thank you for breaking down instructions to make a recipe clearer. I was wondering if a dough hook should be used for mixing (Kitchen Aid Stand Mixer) or the paddle attachment? Thank you! Could you apply the no knead method to this bread? Any issue of leaving raw egg in the dough over night to proof? I redecently discovered the wonders of sourdough (bread making in general), and found a recipe for Hokkaido Milk Bread using sourdough starter with a long (coldest, because it’s winter) ferment, and there were no problems with the flavor/egg in the dough. Maybe in the summer I may be more careful. That’s not to say that I think this recipe can be made into a no knead version. I’m not an experienced enough bread baker or a professional cook/baker/pastry chef. Generally, no knead breads tend to have a longer bulk fermenting period, during which gluten and flavors develop. And because it’s left standing for longer, the yeast is reduced so it doesn’t over ferment the dough. If you were to keep this recipe the same and not knead and not give it the extra time (and hydration), it may not produce the correct texture, especially given that this is an enriched dough and would need more vigorous gluten development (either by kneading, or using hydration and time). Just a thought. Maybe if you want to convert this to a no knead bread, and it’s colder in your kitchen, you can try making a preferment with a reduced yeast amount and a bit of the flour and water (liquid) in the recipe first. Then once it ferments, mix in the rest of the ingredients and let stand for 3-6 hrs, doing some stretch and folds to help gluten organization. Then shape and bake after a second rise. No guarantee that it’ll produce good results, but a fun experiment! I’ve been watching your videos. Would you please look into the eggs that you are using. Your yolk are so yellow. When you use the pasture egg. The yolk is orange. They have no chemicals and adjectives that they feed the chickens. Please read about “pasture” eggs. There about $4.00 more a dozen. But worth it for your health? I get mine a Ralph’s supermarket. Do I HAVE to use bread flour for this Egg Bread, I use all purpose for all my other breads? I prefer bread flour but of course, all purpose is fine too. I will adjust the recipe so thanks for asking. Will the bread works without eggs? This recipe is based on the eggs so it’s best to look for a different recipe. Hi Jenny. Can you please tell me how hot the milk should be. I don’t have a thermometer – so should it be scalding milk? It should feel like hot tap water (not scalding). Thanks Jenny. I hope it works – it’s rising as I type! I added raisins to it. My mother used to call her Polish bread Babka, but really her bread was more like this egg bread of yours. Babka is a sweeter dessert bread I discovered when looking for recipes! Love it when mothers don’t pass these tips before they depart this world! Anyway, I’ll report back when it’s risen, then baked – I’m excited. Thanks so much for all your help. You’re a genius to let us mere mortals know how many times to knead something, such as this recipe – and also created the best perogy dough for me in the past 2 years since I found your videos. That was a life saver, as I had no idea how long to knead the dough for. I thought I was supposed to knead it for a long time, and I ended up throwing it across the room in past years, gave up, and bought them instead. Then I found your perogy dough recipe – voila – magic! So thanks again! After many try’s at yeast baking I gave up! Mind you I had enough bricks to build a house. Since I found your website – which is very recent – I have made crusty bread, whole wheat, tunnels of cinnamon and I’m just proofing the egg bread. Thank you for restoring my love of baking! I have experienced the same thing. It has opened up a whole new world for me and my family. These home made breads taste so good and I never thought I could make them either. Thank you Jenny for teaching me too!!! I bake this bread every weekend and by Monday it’s gone. My husband loves it with butter plum jam which compliments the poppy seeds with breakfast in the morning. Everyone wants me to bake them a loaf so 35 working days left and I will have time to bake everyday. Jenny I love all your recipes and tell all friends how great and easy they are to prepare. Of course after I watch your videos (: Glad I found you! I made your egg bread and turn it really good, that is the bread I’ll make many times. And you cinnamon rolls are the best I ever made they are great. I’m 85 and love to bake. 85 and baking – it’s the best hobby there is! I ran out of parchment paper so can I just grease my pan instead? If so what kind of oil should I use? I find that butter is best for greasing so I use either butter or my mixture of butter and oil. I would love to get your butter and oil mixture recipe. Is it on your website or any chance you could share here? could regular yeast be used to make this instead of rapid rise? You can use regular yeast but it may take longer to rise. I made it today. It turned out fantastic. It looks great and is delicious. Except for the “tunnels of cinnamon” the technique for my egg bread is very much like the cinnamon-raisin bread video so please see if that helps.